This is what my dinns consists of most evenings of late, with a variation of fish and chicken so there hasn’t been a recipe the past couple of weeks. Apologies for the bad quality photograph. I have over the past while gained a few unwanted kilos, which wasn’t too difficult to accomplish however trying to get rid of them aint so easy! It is very true the older you get, the more difficult it is to shed a few kilos. So in light of an important birthday coming up in May, I thought I would get a head start before I am officially, well let’s just say a little older. Anyhoo, without dwelling on the unwanted weight, I have been a very good girl the past couple of weeks watching my calorie intake, increasing my portein, using minimal fat and have for the most part cut carbs out all together – something I didn’t believe was possible, but here I am a couple of weeks in and I am still here to tell the tale. I have never really had much of a sweet tooth so I haven’t cut back on my sugar intake except for consuming very little fruit. I am not officially dieting as I don’t believe in diets, I am just being concious of what I am eating. An average breakfast consists of an egg or two usually scrambled or an omelet of sorts and occasionally a wee cheat with brown bread French toast. Lunch is a salad with protein of sorts and supper pretty much consisting of the same alternatively stir fried veggies with protein. I have not deprived myself of my wine (yip, I have forgone the gin and tonics) and enjoy a spritzer (which also helps with the calories) in the evenings with my meal. If I get peckish through the day, I will have a yoghurt and I drink lots of water with lemon and still quite a few cups of tea. I don’t anticipate I would be this successful in winter, although, I could survive on soup and carb free hearty stews. So here’s to me reaching the point (soon I hope) where I feel comfortable again – I have no idea what that equates to in kilos as I am not particularly concerned with what number the scale throws out at me. Once “there” I will slowly incorporate the foods I have cut out so I can maintain my comfort level. This entry was posted in Daily Blog, Un-Recipes and tagged Cooking, Food, Ingredients, Mandy Frielinghaus, The Complete Cook Book, Weight watching by thecompletebook. Bookmark the permalink. You are well on the way to losing that weight my friend, it is the worst! But I like your battle plan! I have cut down on my carbs and like you I still enjoy my glass of wine:) and hopefully all this decorating I am doing will help me lose as well. Still no camera, so no blogging for me either. o man..weight….I have been having a hard time to look at the me in the mirror…who is that fat lady!! The steak looks so good! I started a low carb diet in Jan 2012 and am down over 100 lbs. It does work. I live on low carb soups most of the time. Good luck. It sounds like you’ll drop those additional kilos in no time, Mandy. You certainly have a good plan and the wherewithal to stick to it. I really need to follow your example and pay more attention to what I’m eating. It was a very good — make that VERY good — holiday season and I look like it was even better. Whatever happened to that metabolism we all had at 20 years of age, where we could lose a kilo just by skipping lunch? Ooh, yoghurt and sweet chili. The combo sounds great for steak and salad. I think your approach to getting to a comfortable weight is perfect. The way you are going about it is the way to successfully keep it all as well. when I visit you, will you cook for me? You’re inspiring Mandy! I can totally relate. It started with our trip to New Orleans and then we rolled right into the holidays. And like you said – it’s hard to not go for some comfort foods in the winter. I’m trying though. Finally got my workouts back on track. Now if I could get my eating habits on board with that, all will be well again. 😉 I agree with many of the sentiments above – wish I had my old metabolism back too! I like your approach and I think you’ll be right where you want to be for that big birthday. No doubts about it! I don’t have scales – I think it’s better to gauge how you feel in terms of size, health and comfort. I think we know when we’re over-eating. Sounds like you have a sensible balanced plan. I think I need to visit your weight loss strategy. That T-Bone looks amazing! Have a great week, Mandy! Good luck Mands! 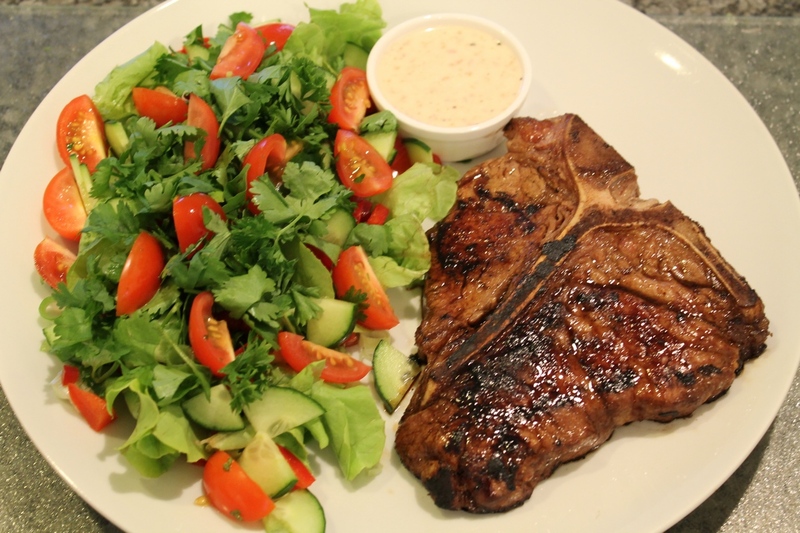 Your steak and salad looks yum!